Keith Yackey lost his Mom when she was just 56 years old. That day, Keith determined he would live life with no regrets. So he started a business investing in real estate – a business he’d been too afraid to dive into until then. In just two years, he had built an 8-figure investing firm. He taught thousands of other investors how to do what he’d done, then started an online education company to teach people how to raise money for their real estate investments. 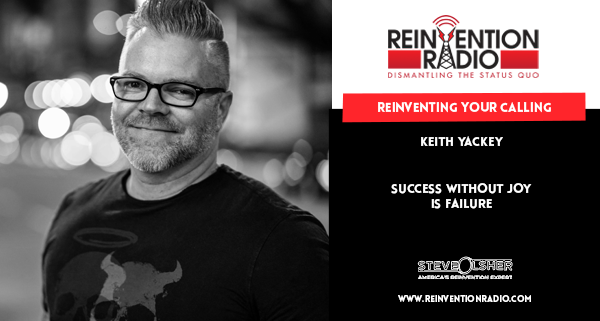 Also a stand-up comedian and former pastor who walked away from the church, losing everything – his community, identity and even his own self-worth – Keith subsequently discovered through multiple business successes he loved to teach and is teaching the world it is okay to walk your own path. He performs in the hottest clubs with some of the biggest names in comedy. Keith’s program, Amplify Live Experience, is a unique live four-day experience that teaches people how to find their mission, message, passion and purpose and how to make money with that passion. He believes that success without joy is failure, so he shares and serves others to help bring joy into their personal and professional lives. Tune in to hear Steve, Mary, and Richard chat with Keith about finding your calling and positioning yourself as the “go to” expert in your industry. What keeps Keith up at night? Reinventing Sleep Deprivation – In this episode, tune in to hear Steve, Mary, and Richard chat with Kim Sutton about how she helps entrepreneurs achieve and appreciate personal and professional success, without burnout.